The House of David Artwork is known throughout the midwest, and many who don't know it as "House of David" have probably seen it and thought it was Art-deco. Using a finish totally unique to the colony, they made over 600 different statues, figures and plaques which they shipped all around the world. This unique finish is called "Hydro-stone," and was an unusual mixture of a very hard plaster-type substance which was then finished with a pearlized-ivory type finish. After buffing the finish out, these pieces were used as free-standing statues, bookends, ashtrays, pen-holders, plant stands, etc. Many featured animals, and religious scenes, while others were more gothic with cherubs, chariots and the like. The Artist in charge of all these works was an Italian man by the name of Frank Rosetta, who is being considered for national recognition. These pearlized pieces range from 2 inches to 7 feet tall, and are very much wanted by the House of David Museum. 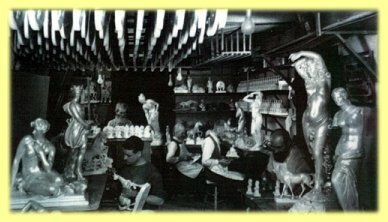 Many of these pieces were featured on this areas "Blossomland Parade" floats, and possibly footage of these older floats is available to the Museum. We also seek photographs, postcards, etc. featuring these brilliant pieces.